1. Sarah Ann Reynolds b 14 Mar 1833 Scott Co VA d 2 Sept 1892 Wayne Co WV; buried Mount Vernon Cemetery, Wayne Co WV; m. 1848 to Jonas Powers 1848 b 1 Sept 1820 Scott Co VA d 1 Oct 1899 Wayne Co WV; buried Mount Vernon Cemetery, Wayne Co WV; s/o Forrest M Powers and Mary Polly Alley. 2. 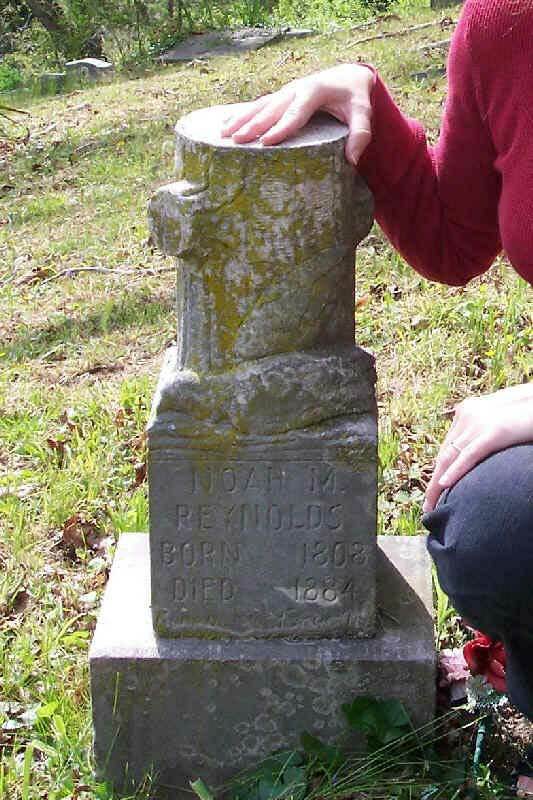 Eliza Catherine Reynolds b 1835 Scott Co VA; m. 22 Nov 1855 to Nelson Nelt Craft b 7 Sept 1834 d 20 Jul 1916; s/o Archelous Craft and Letty Webb. Nelson Nelt Craft m. (2) to Julie Parks b 20 Dec 1865 d 23 Mar 1953. 3. William Henry Reynolds b 28 Feb 1837 Russell Co VA d 8 Dec 1890 Seco, Letcher Co KY; buried Reynolds Cemetery, Seco, Letcher Co KY; m. 4 Mar 1859 Letcher Co KY to Frances Matilda Baker b 23 Apr 1844 Floyd Co KY d 26 Mar 1927 Seco, Letcher Co KY; buried Reynolds Cemetery, Seco, Letcher Co KY; d/o Henry Baker and Mary Catherine Privett. These are Annette Potter's Great Grandparents. 4. Stephen Nathaniel Reynolds b 1838 d Jun 1877 Letcher Co KY; buried Reynolds Family Cemetery with a Civil War Military stone; m. Drusilla Siller Craft b 7 Apr 1839 Perry Co KY d 27 Aug 1876; d/o Joseph Craft Sr and Martha Irby Bates. Stephen Nathaniel Reynolds and his brother William Henry Reynolds were in the 39th KY Mounted Infantry as Union soldiers together. 6. Frances Jane Reynolds b 1845. 7. Joseph Coleman Reynolds Sr (Known as Josiah in Volume II of the Letcher Co., Family Histories) b 26 Nov 1847 VA d 18 Nov 1930 Union, Lewis Co, Washington State; buried 19 Nov 1930 the Claquato Cemetery, Chehalis, Lewis County, Washington State; m. 29 Feb 1868 Letcher Co., KY (1) to Mary Minerva Morgan b 15 Mar 1850 Letcher Co KY d 29 Mar 1904 Letcher Co KY of Tuberculosis; d/o James Jim Morgan and Mary Emily Polly. Joseph Coleman Reynolds m. 2 Mar 1901 Millstone, Letcher Co KY to (2) Hortense Lee Friley b 26 May 1861 Roanoke, Russell Co VA d 27 Oct 1943 Lexington, Fayette Co KY; buried Lexington KY Cemetery next to daughter, Marjorie Lee Reynolds Rogers. Hortense Lee Friley was the d/o Rachel Lee adopted by Isaac Friley. 9. Mary Chaney Reynolds b 8 Mar 1852 VA d 3 Apr 1926 Huntington, Cabell Co WV; buried Powers Cemetery, Cabell Co WV; m. 20 May 1868 to Wade Hampton Powers b 17 Jul 1835 Scott Co VA d 4 Jul 1923 Huntington, Cabell Co WV; buried Powers Cemetery, Cabell Co WV; d/o Forrest Meaker Powers and Mary Polly Alley. 10. Noah Milburn Cuge Reynolds b 15 Dec 1855 Letcher Co KY d 20 Apr 1923 Mayo Clinic TN; buried Well Springs Cemetery, near Lafollette, Campbell Co TN; m. 15 Nov 1879 Blountsville, TN to Martha Ann Craft b 12 Sept 1860 Craftsville, KY d 16 Sept 1951 TN; buried Well Springs Cemetery, near Lafollette, Campbell Co TN; d/o John Henderson Craft and Nancy Jane Caudill. Well Springs Cemetery Photos. The first Sunday School in this county, was organized by Mrs. Chenie (Chaney) Reynolds, wife of Noah Reynolds, at the place now known as Seco. The Reynolds came at the close of the war (Revolutionary War), from East Virginia. The men in the family were brick masons and built the first brick house in Letcher County, for their home. They burned their own brick, then burned brick for the court house, and built it. They built the house across the street for W. H. Nichols. They were good, progressive people, good citizens, belonging to the Methodist Church. Mrs Reynolds had a great deal of opposition to her Sunday School in that day. It was a new venture in the mountains, where anything new is thoroughly studied before being accepted. Seco is located on the old Reynolds farm, the place where our county judge, Dr B. F. Wright, grew up, and is now practicing medicine. Seco is on the north-east side of Boonesfork. Boonesfork takes its name from Daniel Boone who, at the junction of the Kentucky River and Boonesfork, carved his name on a beech tree. At the junction of these two streams, Captain M.V. Bates, the world's biggest man in his day, was born and grew to manhood. He was 7 feet and 11 inches tall, and weighed 496 pounds. He served as captain in the Rebel army, with Lieutenant J. L. Craft, and was captured by the Yankees near the close of the Civil War. He was placed on a Big Sandy boat and exhibited as "Jeff Davis' Baby". Soon after the war was over he joined the John Robinson Shows. His tours with the show took him all over the civilized world. While in England at London, Queen Victoria presented him with a large watch, about the size of a saucer, as a gift from "the largest city in the world to the largest man." Captain Bates married the world's larges woman, who is said to have weighed 598 pounds and was 8 feet tall.